The logistics service provider NEX Logistics, a subsidiary of the Japanese Nippon Express, has ordered a forklift fleet from UniCarriers for its warehouse in Bedburg/Erft (Germany). Since September 2018, a total of 37 new vehicles have ensured a smooth flow of goods there. From Bedburg, NEX Logistics handles deliveries to the entire EMEA region for a customer from the electronics industry. In addition to the forklifts, UniCarriers also supplied battery change systems solutions, which can replace the heavy batteries of the reach trucks automatically in just one minute. The delivery includes seven UHD reach trucks, 15 PPL low-level order pickers, 13 PMR pallet trucks and two EPH high-level order pickers. The trucks are used for handling and picking the high-quality electronic equipment. After delivery and palletising of the goods, the pallet trucks transport the pallets to the high-bay warehouse. The reach trucks are deployed for storage and retrieval in the wide aisle warehouse, which contains racking of up to 12.5 m in height. Thanks to an ergonomic seat with tilting backrest and an integrated camera system, these are ideally suited for working at high heights. For order picking, the reach trucks place the required pallets in the lowest rack level. Here the goods are picked up in the required quantity with the help of PPL order pickers and then prepared for dispatch in the staging area. The two high-level order pickers serve exclusively for the permanent inventory of stocks – an important task in a 65,000 m2 warehouse made up of several halls. 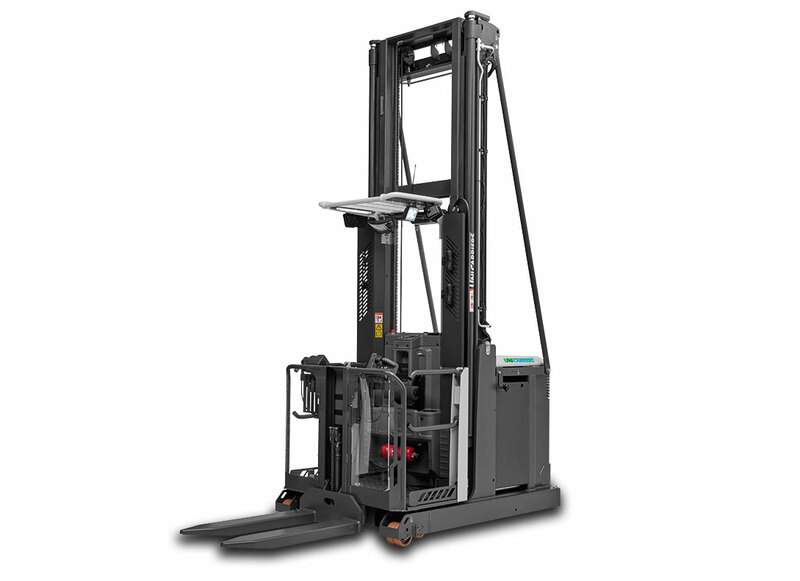 UniCarriers also provides its customer with the necessary equipment for the successful operation of their forklifts. This includes the fleet management system VOM, which monitors the operating time and documents any damage to the vehicles. Additionally, UniCarriers equips the warehouse with battery change systems. The so-called Battsman is used for the low-lift trucks. It transports the discharged battery to a charging station where it picks up a full battery. The reach truck batteries, which weigh up to 800 kg, are replaced within one minute by a Fast-Track-Power-Plus system. The operating time of the trucks is thus maximized, while the drivers benefit from a safe and ergonomic changing system. Both solutions have been developed by UniCarriers. Captions Image 1 and 2: With the new order for 37 vehicles, NEX Logistics is once again placing its trust in UniCarriers. The order includes seven UHD reach trucks and two EPH high-level order pickers. UniCarriers is a globally active developer and manufacturer of industrial trucks. Its versatile, customisable transport solutions for logistics and warehouses are produced at its production facilities in Sweden, Spain, Japan, China and the US. Its products are sold at specialist retailers or directly to end customers by an experienced team of sales experts. Its main customers are in the automotive, construction, food, logistics and pharmaceuticals sectors, heavy industry and the processing industry. UniCarriers was formed in 2011 following the merger of Nissan Forklift, TCM and Atlet. Since 2017 the brand has belonged to Mitsubishi Logisnext Co., Ltd. based in Kyoto, Japan. UniCarriers Europe AB, based in Mölnlycke, near Gothenburg, Sweden, is a one-hundred-percent subsidiary of the Japanese corporation. With a portfolio comprising six brands, 11,000 employees and total sales of around 3.3 billion euros in the financial year 2017, Mitsubishi Logisnext is the world’s third-largest forklift manufacturer.